Not quite sure you’ve got a handle on basic personal finance terms? You’re not alone. Personal finance isn’t something most of us learn about in school. You pick up things as you go through life and usually learn by trial and error. As a result, it can happen that you run across a word in your financial life that you don’t know. Personal finance is an important area of knowledge to understand, but it can also be confusing for those who are not professionally trained financial advisors. A basic understanding of personal finance terminology can empower you to make more informed and educated personal finance decisions. Regardless of your age or earning power, it’s important to understand how common personal finance terms apply to your financial life. It’s easy to get hung up on confusing terms when making a big financial decision. This practical glossary demystifies personal finance so that you can focus on what’s important – taking control of your money! 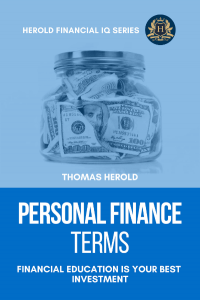 This practical glossary book compiles a list of over 130 most common personal finance terms you’re likely to encounter. Every term is explained in detail, with clear and concise article style description and practical examples. Understanding personal finance terminology, whether you have a dedicated financial planner or not, makes it easier to manage your money in a way that makes sense and works for you, and with no surprises due to lack of understanding. Not sure what a Roth IRA is? Uncertain about the Estate Tax? Want to learn more about compounding interest? Completely ignorant about anything financial? Then this is for you! Understanding the terminology can allow you to make decisions more quickly and easily. This is something that is important in the fast-moving world of personal finance. Buying a new car, deciding about retirement benefits, or even choosing which checking account to open can be time-sensitive decisions, and understanding the basic terminology can make it easier! With this knowledge, you’ll be empowered to take control of your financial present and future.